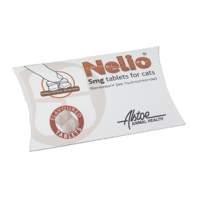 Nelio Tablets for Cats, it is a prescription medicine in a oblong shaped formulation. These oblong shaped beige tablets have been scored so that they can easily be halved for easier administration. Each 2.5mg tablet contains benazepril 2.30mg. Benazepril contains the same active ingredient as in Fortekor. Nelio tablets are flavoured and may be taken spontaneously by cats, but can also be administered directly into the animals mouth or be given with food if necessary. 2.5mg tablets are suitable for cats for the treatment of chronic renal insufficiency.